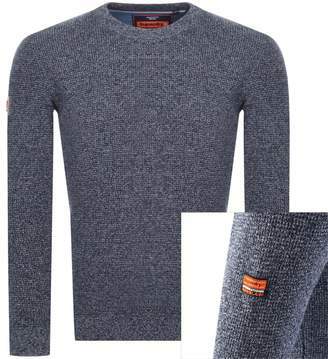 Superdry Stadium Crew Neck Knit Jumper In Trois Blue Twist, An overall woven knit jumper in a two tone design in blue and white. A ribbed knit crew neckline and a ribbed knit design to the waistband and cuffs on the long sleeves. The signature Superdry woven logo patch is situated at the upper right sleeve in navy, white and orange. 100% Cotton. Part Of The Brand New Collection Of Superdry Hoodies, Jumpers And Sweatshirts Live Online.